Packing a house can seem like a monumental task. With 9 moving experiences under my belt, I understand there is much chaos that can result from packing haphazardly. The goal is provide you with helpful tips to get you moving. There are specific dos and don’ts that can save you a lot of stress while packing up all of your worldly goods. These tips for packing furniture to move can help you avoid some major headaches in your moving process. Suitcases for each of your family members and pets. One or more coolers, paper plates and bowls, paper cups, plastic silverware, containers for leftover food, and baggies for sandwiches. Boxes or plastic containers, bags, tags, moving tape and dispenser, permanent markers, and a small tool box with such items as a screwdriver, drill, hammer, pliers etc. Packing peanuts, bubble wrap, newspaper, or old towels etc. Old quilts or blankets, or rolls of painters plastic for packing the furniture. This is very important. You will be unable to access most of your worldly goods for quite some time while you are moving. This is a great way to be sure you have all that you need. Be sure to pack all of the daily essentials, and enough clothes for a week or two. The suitcases go in your car not the moving van. It is a good idea to pack a separate suitcase with shoes for the family. This solves the problem of trying to keep the dirty shoes separate from the clothes. If you must pack them together, consider placing your shoes in plastic or paper bags. Remember to pack any medications with instructions or phone numbers for doctors in your handy bag or suitcase. Be sure to include important documents you will need to retrieve easily, and items like extra checks etc. There is nothing more frustrating than needing an item like this and not having a clue where it is. Worse than that is knowing it is packed underneath the mass of boxes that used to be in your home. Having food handy is vital during the moving process. Not only will you save time and money, but this gives the entire family a sense of home. Pack this in your car or keep it with you. Do not pack your coolers in the moving truck. By packing several coolers, you not only save your condiments and other items you spent hard-earned cash on, but you also make eating easier. Be sure to pack some easy to grab foods, such as pre-made sandwiches and drinks. Date them if you are worried about spoilage. Top off the ice daily, and you are set. You can decide on giving some frozen food, or other items you cannot keep away to a food bank or a neighbor. Consider what items your freezer can be cooked in a couple of days on a portable stove top, and use this to keep the entire contents cold for a couple of days. You can also freeze water ahead in juice jugs and have a cooler that is cold for up to a week. Distilled water freezes the hardest. You can drink the water later, and it will be very cold and refreshing. Now that you have your living items where you can access them, it is time to think about how you will pack up all of your other items. Think this through. Decide which items are going to need extra protection and consider packing them in plastic containers that can be reused later. Items that are off-season are good candidates for this. Boxes of all sizes need to be acquired. 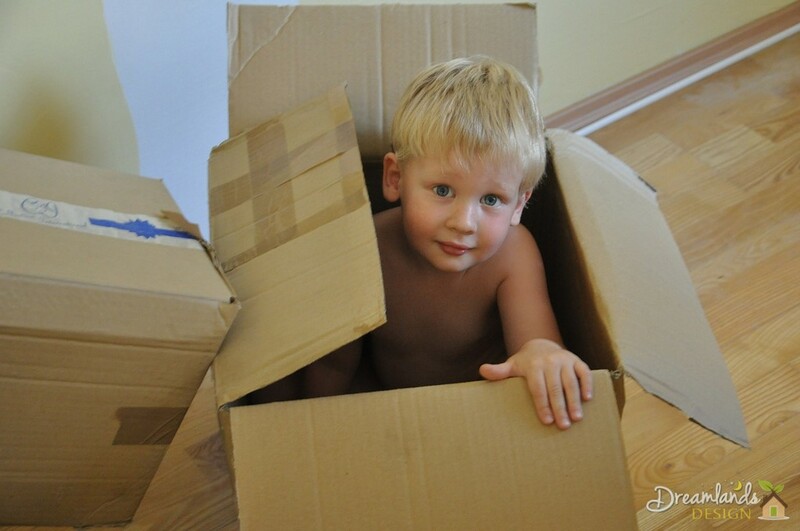 If you wish to keep the size of box uniform, you would need to buy them from a moving company. Many stores will give you boxes for free. Finally, purchase some trash bags with handles. This allows you to tie them shut. *Note: Lighter colored bags can be easily labeled with a permanent marker. Dark bags will need stick on labels or tags. Once you have decided which type of packaging suits your stuff, you next need to either buy labels or tags, or purchase permanent markers. If you are using a mover, labels may be a way to clearly identify that the boxes are yours. If you are moving things yourself, markers may do the job and save you some money. Get creative, and consider using different colored permanent markers. Even the most reading challenged helper can easily identify colors. This makes unloading easier, and ensures your stuff reaches the proper room upon unloading. It is important to pack your breakables carefully. This means either placing them in a box of peanuts, or wrapping them in newspapers. Some like to include breakable kitchenware in boxes of clothes. Although this is a workable plan, it causes problems when you get to your new home as the clothes need to go to a different room than the kitchen items. If the items remain in the same room as the clothes, there is no problem. Be sure to make a list of all of the items you rarely use or that are off-season. This could include off-season clothes, sports gear, decorations, and more. Making this list ensures that all of the people involved in helping you pack know exactly what is top priority, and what can be boxed to retrieve at a later date. This makes your life easier and less stressful in the end. You will want to pack your off-season items the same way that you pack everything else, keeping like with like. You do not want a hodgepodge of items in one box labeled off-season, but you want to divide it by where it goes. Example: Garage: Off-season tools. Be fairly specific. This will be a sanity saver later on. It is important to plan on shipping highly valuable items or items you could never replace by certified mail. Another option is to keep them locked in your personal vehicle. Highly valuable items need to be insured, especially if you hire a professional mover. Certified mail is the best option. Pack these items well and with much padding, as you want to have your treasures intact upon arrival. The importance of packing your furniture last is vital. The problem with packing it first is, it is unpacked last at your destination. This does not work. If you unpack all of your boxes and smaller items first, they end up all over the place and often not in the designated rooms. This poses a problem as you are anxious to get the furniture out. By waiting to pack your furniture last, not only do you have a place to sit and eat as you pack, but when you get to your new destination, it goes in the house first. This has several benefits. One, those moving the furniture can place it where you want it in an empty room. This helps you not to need it moved again later. Secondly, it gives you something to set some of your boxes on, and ensures that the big furniture will fit in the house. When the house is filled with items first, you end up squeezing the furniture in, and you have no room to walk – not a good scenario. You can use quilts, blankets, or even painters plastic to protect your furniture from scrapes. Be sure to do this, as neglecting this would be a big and costly mistake. Also consider taking apart assembled furniture such as desks, shelves, beds etc. Once you have all of your items in the moving truck or van, it is time to do a final sweep of the house. You can delegate a room to each family member. Be sure to have a checklist that guides them through the process to ensure few mistakes. Small children may not think to look up high and adults may forget to look under things. Work together, and cover every inch to ensure you do not lose an important piece of your life in the move. Take one last look, and perhaps gather the family for a final photo of this change in your life, and off you go on a new adventure. When you know how to make things yourself, there is a sense of pride in that. When you find just the right instructions to help you in your adventure, that is a match made in Heaven. Dream Lands Design strives to bring you just that. Concise clear, visual instructions on things you want to know how to do.